The primary purpose of this post was to show what the silicone looked like on the Dark Monk Studio Nunchaku, as I wished I could see samples before I bought them. Online, there now exist Yellow, White, Blue, and Red pairs in some Flowtrickers' possession, and I hope it helps in making the decision for potential buyers. As I mentioned in my last post reviewing the blue silicone Dark Monk Studio Nunchaku, I was thinking about purchasing another pair after I found my first to be so solid. I gave it some thought, as I did before I bought my first pair. I was being a wise consumer, thinking to myself "do I only want these because Ken uses them? Do I really think that just a change of chucks would make me better?" Eventually I decided to try them because I had realized that not many nunchucks were as heavy as I wanted. I decided I wouldn't be out much by buying one pair and trying it out (the blue ones). Obviously it's not the chucks who make the artist look great. 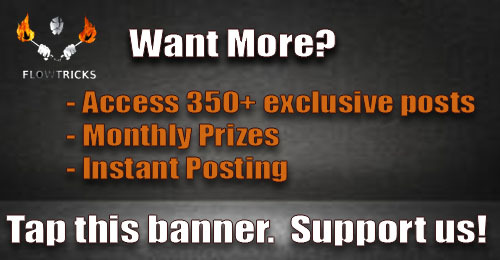 It is the artist, their ability, and their willingness to pursue greater ability. But man, these chucks sure made it easier, and more fun. As I mentioned in my last post, the moves which needed more end weight were a cinch with these babies. 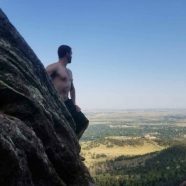 It transformed my play like no other, and not necessarily because they could do other things more easily, but because being able to land those moves really catapulted my enthusiasm, leading me into >1hr sessions, not just for practice, but for personal enjoyment and quite the therapeutic experience. I still tried to be responsible with my money, asking myself "do I really need a second pair?" and my wallet after winning the tables at Las Vegas said "YES!" So I bought some red ones, and what the heck, might as well get some fire chucks too, hehe. I finally have a second pair of Studio Chucks now, and I get to see the difference of owning them for a minute versus a couple weeks. What you'll notice between the two almost instantly besides the silicone color is: the rope color. It comes in silver at first, but they will fade out to a wick-like color by the time I've had those blue ones (2 weeks). I didn't even notice until now. I don't think of this as an issue, but if I had a preference, keeping a black or silver cord would really help them in looking sharp with their dominant black color. However, the rope is comfortable, non-abrasive, and not too slippery or tacky, so I have no quarrels. No two chucks are made alike of course. Dark Monk makes these as they receive the orders, giving us the ability to choose colors which is great. The red ones however do choke up a little higher on the handle with the first band of silicone, somewhat cramping my grip. I played with those red ones for just a little while by themselves and not after long, I didn't notice it anymore. I remember how goofy my blue ones felt when I first got them but now it is just natural. They follow standard dimensions in making their chucks, but a millimeter difference on the reds is noticeable when I use both these chucks as doubles. But again, no quarrels. The silicone may lose its luster over time too, but I'll have to see. does lose its luster within about a week of consistent use. The color stays, but the shine vanishes. Referring to my blue ones in my initial post, they may have been shinier, but I'm not sure. I'll have to see with these red ones. Now about the doubles play, these babies are pretty thick. It hasn't interfered with my doubles play, but I feel like I have to leave more space for them between each other and with myself. However, I'm 99% sure it's because they feel new and different, and not because I need to change anything. Lastly, the grip. The inner grip is some dense harder foam for each (including the fire chucks). On my red ones it is pretty grippy, but on my old blue ones, it is smoother. Like the rope, I never noticed the change, so it will only be awkward on doubles up until probably two weeks in the future. The Bottom Line: Get yourself a pair NOW! Solid for training! Mine are slightly lighter in weight than the Studio Chucks. I chose the carbon fiber variant. 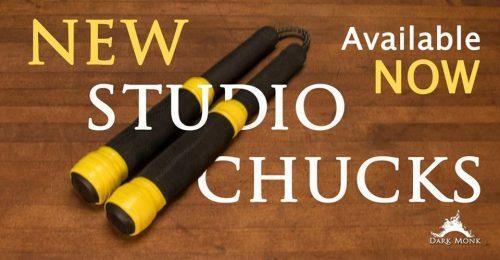 The Studio Nunchaku are 11oz. Carbon Fiber is 10.7oz and $10 extra. I can definitely feel the 0.3oz difference between my pairs, but I think it is fitting that my Fire Nunchaku should be faster than my training chucks, especially for performance. 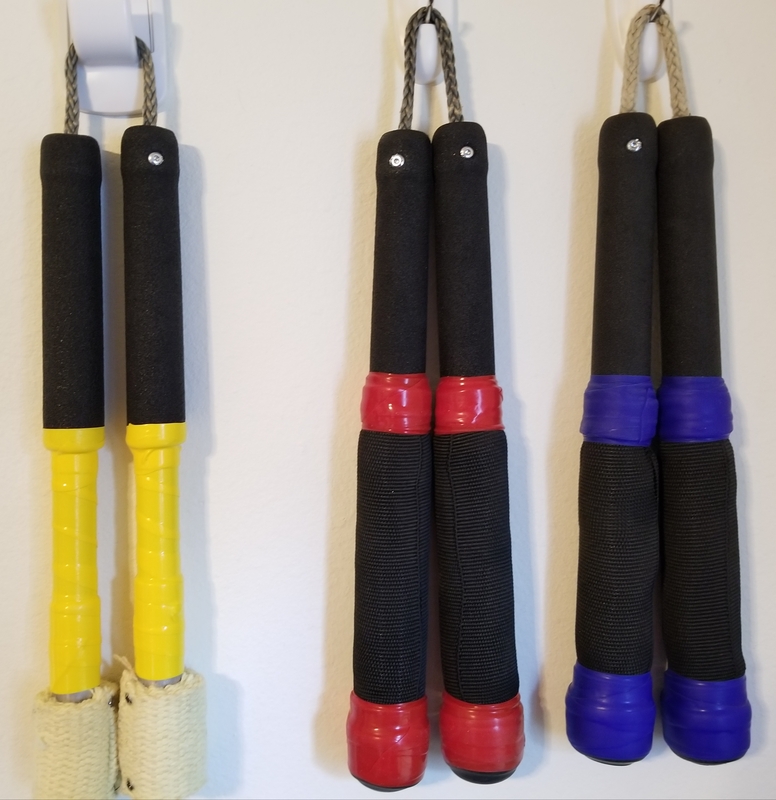 I hadn't previously known that I could choose a silicone color for the Fire Nunchaku, and the site did not show an example of a silicone-donned pair. I assumed it would cover the portion immediately next to the wick. What they do in reality is wrap the entire exposed metal portion. While the fire is the most eye-catching part of the chucks, the silicone wrap is very important for safety reasons. According to the site, "It is the difference in grabbing a hot coffee mug vs a hot cast iron pan" when the fire is on. When I got these chucks, the wrap was slightly coming off, but easily put back on. I haven't even tried lighting up these bad boys yet, but I will edit the post when I do. I was just so excited to finally get them and talk about them. When I spin these with fire, it will be my first fire experience, so I'm very excited! As for handling and using as nunchucks, they are a solid, resilient, speedier pair. I thought the wicking would get in the way of sym-x movements, moonwaves and sunwaves, but the wicking appears slimmer than it does on the site. The Bottom Line: I haven't even used them for fire yet, but I have 0 regrets! I really do enjoy the Dark Monk Studio Nunchaku, and I think Ken Hill really helped make something great in adding to their design. They're really some solid chucks and I'm glad I'll be able to train with such an attractive pair for so long without the risk of breaking them or my face. They really added to my enthusiasm in training and started a turning point in my nunchaku play. This newfound confidence helped in making the decision to move to fire, and I couldn't be more excited.